The OU Food Pantry officially opened on March 22nd according to Matt Marks, student director of the pantry. 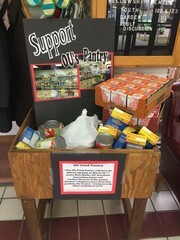 Student Volunteers have been busy stocking the Pantry - trying to help other students in need. If you would like to help, please bring your donation to the church foyer.